Claro Energy, a leading solar solution provider company, today announced that it has bagged a 1 MW solar project from Madhya Pradesh Madhya Kshetra Vidyut Vitran Company Limited (MPMKVVCL) to install rooftop solar units at different locations in Bhopal, Hoshangabad, Gwalior and Jabalpur. Madhya Pradesh is on the fast track to decarbonise its electricity sector and tackle air pollution, by making way for solar energy. Currently ranked as no. 6 among Indian states in installed solar capacity, is rising the ladder to the top by rolling out various initiatives in renewable energy sector. MPMKVVCL had recently floated a tender for installation of Solar Rooftop projects totalling about 10 MW at various locations in MP. Claro energy emerged as a successful bidder in the 100-1000 KW category and now has been empanelled to install a total of 1 MW in Central MP Discom areas of Bhopal, Hoshangabad,Gwalior and Jabalpur. The company led by IIT Bombay, MIT and Kellogg School of Management alumni; Kartik Wahi, Gaurav Kumar and Soumitra Mishra have already installed more than 6000 solar pumps across 16 states of India, for drinking, irrigation and sanitation purposes. “The cost of the project is Rs 53.9 per watt and there is a subsidy component of 30 percent at these prices, bringing the effective cost down to Rs. 37.73 for the customer.” said Kartik Wahi, Director Claro Energy. As per the agreement, the organizations registered as non-profit are permitted to avail and apply for the installation of solar rooftop power generation systems, on the premises. This scheme is exclusively for non-profit registered organizations which includes government aided schools, residential buildings, community centres, old age homes, institutes for the use of community like trusts, NGOS, voluntary organizations, Health & Medical institutions, educational institutes and common service establishments. “With the 30 percent subsidy coming in, the payback period will likely be of 3-4 years and 100 KW & 1 MW capacity of solar rooftop panels can cut down carbon emission up-to 109.5 and 1095 tons per annum respectively," Wahi added. 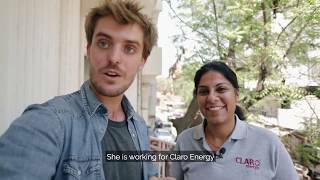 Claro Energy, a Delhi-based company founded in January 2011, is providing solar-powered water pumping solutions to meet agricultural irrigation, aeration, fisheries and drinking water needs in off-grid areas. The company has already spread its base in 16 states and has installed over 2,200 pump sets. It operates in high power deficit, diesel dependent, agrarian and poor economic regions of India. The team aims to be the largest provider of affordable, adequate and timely irrigation to millions of farmers in India. Claro Energy has been working with state governments, commercial and industrial customers, agri-enterprises, farmer cooperatives and individual farmers in India to design innovative affordable solar solutions to meet their energy requirements. In 6 years, with over 3000 off-grid solar pump systems installed in nearly 16 states across the country. The company is one of the front runners in the solar industry today. Claro has brought more than 12000 acres of land under irrigation and impacted more than 100000 lives.